"It's one thing to read and talk about seismic and volcanic hazard; it's another thing to experience it," said geophysicist Tiziana Vanorio, an assistant professor in Stanford's School of Earth, Energy & Environmental Sciences (Stanford Earth). "I wanted to share this with them." 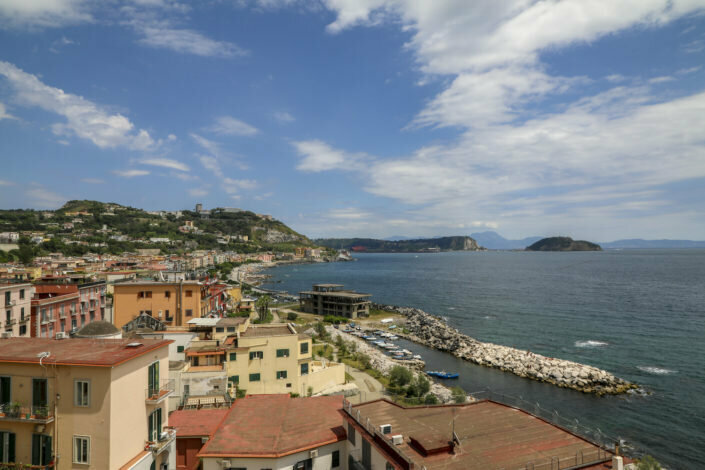 The journey to Stromboli had begun the day before in Vanorio's hometown, Pozzuoli, a colorful port city founded by the Greeks and later occupied by the Romans, at the center of a volcanic caldera, or depression, known as Campi Flegrei. Vanorio, the 13 students and two teaching associates boarded a hydrofoil in Naples and sailed south across the deep blue water of the Tyrrhenian for nearly four quiet hours before catching sight of smoke, steam and gases puffing from Stromboli's cone. Reaching the top would prove more arduous – a five-hour climb up steep slopes of ash and rock. Sedimentologist Nora Nieminski, a postdoctoral researcher at Stanford Earth and a guest instructor on the trip, sprinted ahead to shoot drone footage that she would later help the students manipulate to create 3-D models of the volcano. But the rest of the group walked without hurry. Halfway to the top, they stopped to rest near a dark scar on the volcano's northern flank known as the Sciara del Fuoco, where the volcano has collapsed on itself. Dionne Thomas, '20, a student on the trip who is majoring in chemical engineering, remembers smelling dirt and ash, seeing the Tyrrhenian Sea reflecting the sky's late-afternoon wash of orange and blue, and counting down the minutes between small bursts of lava from a caldera upslope. While she noticed the weight of exhaustion from the long climb, she said, "I felt really strong." Offered through Stanford's Bing Overseas Studies Program, the seminar is an opportunity to draw visceral connections between science and history, and to gain a better understanding of Earth along the way. The Neapolitan Province in southern Italy is an ideal place to dive into the science of natural hazards and how they have played into daily life and innovation over thousands of years. Densely populated and peppered with dozens of volcanoes, the region ranks as one of the most hazardous on Earth. The ruins of a Roman harbor and an emperor's villa can be found offshore, sunken like Atlantis as a result of unrest in Earth's crust. "Not many places on Earth experience this kind of seismicity and volcanism, while being an ancient town and functioning as a modern society," Vanorio said. "That's the beauty of the place." 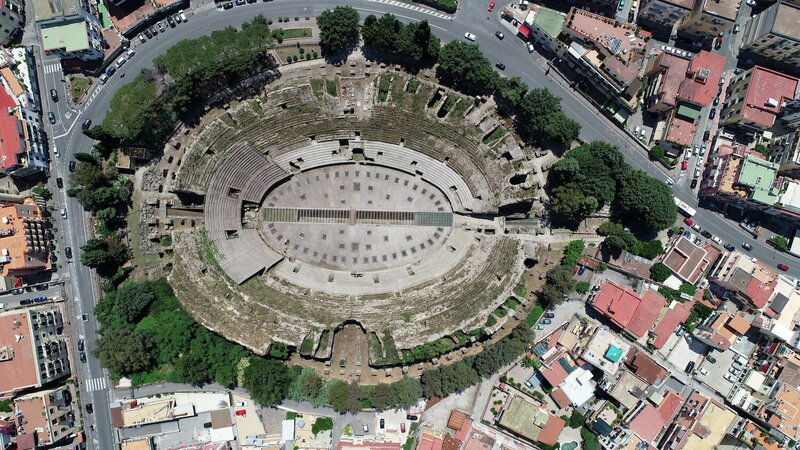 Underlying the seminar's excursions and daily lessons in geophysics, the properties of Roman concrete and 3-D modeling from drone images was a larger exercise in finding connections between different fields of study. It's no accident that students chosen to participate in the seminar represented a wide range of majors, including computer science, physics, classics, chemical engineering and political science. "There are still scientific questions that we don't know how to answer," said Vanorio, who discovered natural processes deep in the subsurface of Campi Flegrei that mirror those in Roman concrete, and has used historical texts to shed light on strengths and the characteristics of both volcanic and engineered materials. "The more we leverage knowledge across different disciplines, the more we can address and solve those problems." For Amara McCune, BS '18, who joined a previous seminar in the region led by Vanorio in 2016, the intermingling of geophysics with dives into the region's culture proved a powerful mix. 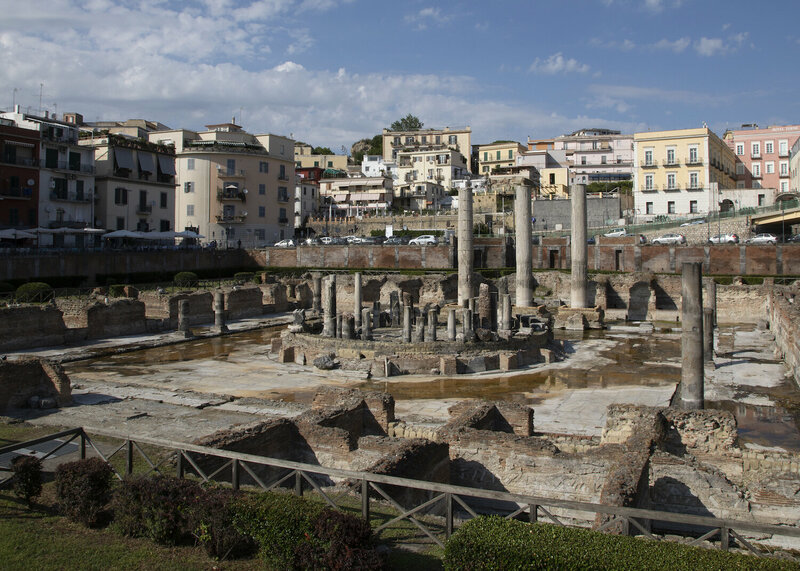 "The unique combination of learning about Pompeii, volcanic uplift and Rome while being on-site, hearing from local guides and having archaeological and geological experts point out features of a location made for an incredibly rich learning experience," she said. Now pursuing a Ph.D. in physics, McCune said the seminar in southern Italy helped to broaden her thinking about how she might apply her degree. "It made me more open to different fields and eager to learn the history and intricacies of the natural world around us," she said. During the most recent trip, darkness fell as the group, giddy in anticipation of the volcano's powerful eruptions, settled in around Stromboli's rim. "It explodes violently and without warning – these big, loud bang explosions followed by incandescent ash flying into the air," explained Dulcie Head, a teaching assistant on the trip and a Ph.D. student in geophysics. "Pozzuoli is possibly the place where Romans, by looking at nature, were inspired to make an iconic material," Vanorio said. They developed a recipe for concrete that lasts for thousands of years using volcanic ash, lime, tiny volcanic rocks and water, while modern concrete often crumbles within 50 years. Atop Stromboli, which scientists carefully monitor for safety, the students also had enough Earth science churning through their heads to see the volcano itself as a natural laboratory. "This volcano is literally producing new rocks as we're sitting here. It's throwing them at us," Head explained. "It's exciting to see such an active process, where a natural event also produces new materials." The group bounced and slid down a path on the volcano's slopes wearing gas masks to protect their lungs from ash and sand kicked up by their feet. Back at their hotel at the foot of the island, they peeled off their masks and washed away Stromboli's detritus. Later, the group learned how to calculate the trajectory and velocity of the volcano's arcing ash projectiles with particle-tracking software. "This was one way for us to use time-lapse images," Vanorio said. "I wanted students from Earth science, from the classics, and engineers to learn how to use this tool because we are finding ourselves using these kinds of images more and more – often captured by drone – whether it's to analyze inaccessible outcrops of rocks or map vast ancient sites or a building." What could have seemed like abstract calculations took on greater resonance in light of the group's up-close encounter with the eruption. "I'll never forget the bright sparks of the eruption against the dark night," said Sylvia Choo, '20, who is majoring in classics and biology. "It was incredible to experience the great force of nature." Some 150 miles across the cool Tyrrhenian, within the Campi Flegrei or "Burning Fields" caldera, lies downtown Pozzuoli. In this city best known to many Italians as the birthplace of Sophia Loren, the ruins of a Roman marketplace are a hub for cross-disciplinary connections. Pozzuoli sits on a restless, Manhattan-sized swath of coast where the rotten-egg smell of sulfur laces the air. Solfatara crater, home of Vulcan, the Roman god of fire, gurgles on the edge of town. And just offshore, sculptures, thermal baths, a villa, bright tiled mosaics and other archaeological ruins rest more than 30 feet below sea level, victims of the caldera's subsidence. Near Pozzuoli's modern-day waterfront, three columns stand amid the ruins of the old marketplace, or Macellum. The students knew from their studies on campus in the spring that the marble trio held a 2000-year record of long-term subsidence and brief periods of uplift. So as the columns came into view when the group first walked down from their villa residence, several students exclaimed, "Oh, there they are!" Gathering close to the columns for a lecture from Vanorio while Nieminski's drone buzzed overhead, they could see bands of tiny holes bored by so-called "stone-eater" mussels – marine mollusks that drilled up and down the columns as the rise and fall of the caldera changed how much of the structures extended above the waterline. "They literally made a mark on history," Choo said. Using skills developed in on-campus seminars led by Nieminski, the students were able to analyze history at the Macellum and other sites with a lighter touch. They built 3-D models of the marketplace from Nieminski's drone imagery and manipulated them with software to take measurements and answer scientific questions of their own devising. Thomas, for example, examined the different materials in the columns to understand how weathering and water pressure from below played out over time. The project, she said, allowed her to weave together knowledge from chemical engineering, physics and math, as well as the geophysics lessons from the seminar. "After this seminar, I am even more convinced that many fields can overlap," she said. The rising seabed also triggered enough earthquakes to prompt evacuation of nearly 40,000 people – including Vanorio, then a teenager – for two years beginning in 1982. "Everyone was worried," she said. "People were expecting an eruption, and we were really concerned about the seismic hazard. The houses were not retrofitted seismically." But as seminar students learned through lectures and readings this summer, the episode tipped off Stanford scientists to an unusual toughness in the rock here. Other volcanic calderas, like Yellowstone or the Long Valley, located east of Yosemite National Park, tend to release the energy accumulated from uplift fairly soon through earthquakes. "Those calderas experience uplift and then almost immediately, seismic activity starts," Vanorio explained. "The rocks deform and then they fracture." In Pozzuoli, earthquakes didn't begin until the Campi Flegrei caldera had deformed by nearly 3 feet. "The question from a rock physics point of view has been, what kind of rocks in the subsurface are able to accommodate such large strain without immediately cracking?" The rock capping this caldera, it turns out, contains fibrous minerals mirroring those in Roman concrete that allow it to stretch and bend before failing under stress. At the marketplace, Vanorio also pointed out that the durability of Roman concrete can be seen in sections of the ancient walls where the bricks made of tuff – a kind of volcanic rock – eroded away long ago, but the mortar made with volcanic ash and lime still remains. "At the end of the day, these ancient sites are made of Earth materials that degrade and change over time," Vanorio said. "We can use rock physics to understand those materials and learn to preserve them better." The iconic cone of Mount Vesuvius rises less than 15 miles west of Pozzuoli. Its eruption in AD 79 is best known for destroying Pompeii, but the same event also buried Herculaneum, a seaside resort town perched on the complex stratovolcano's western base. The students spent a morning walking through the town's narrow streets, noticing elements of everyday life eerily preserved by the superheated pyroclastic flow of ash, molten rock, mud and gas: wooden chests and cupboards, paintings, the burnt wooden door to a study. As a classics major, Choo had some ideas about what life was like in Roman times before she embarked on the seminar. "But it was fascinating to see the places they used to live, walk and socialize," she said. Leaving Herculaneum behind in the afternoon, the group piled into a bus bound for Mount Vesuvius, the source of the town's destruction. Like Campi Flegrei and Stromboli, Vesuvius sits along a tectonic boundary, where the African plate is sliding underneath the Eurasian plate. A tear in the African plate allows heat to seep through Earth's crust, gradually melting rock and building up pressure under Vesuvius, which has erupted more than 50 times since AD 79 – most recently in 1944. From the bus drop-off point, a foot trail led the group up toward the volcano's rim and then down to a shallow shelf in the crater. At the top, more than 4,000 feet above sea level, the air was cool, and the students could see mountains, rolling hills and cities in the distance. Bright green lizards skittered over the rust-colored rocks, fumaroles streamed sulfur-scented steam and Nieminski's drone canvassed the crater as the students listened to a local guide describe the inner workings and history of the 400,000-year-old volcano. Thomas remembers looking down at the sea and clouds. "I felt as if I was on top of the world," she said. "That was the most elated I've ever been in life. It made me feel like I was experiencing to the fullest what life has to offer."